Cobbler’s made and the cake’s are done. Salad’s chilling and coolers are stocked. Oldest boy smoked up two pork loins last night and I’ve got chicken soaking in buttermilk*, ready to be slow-fried shortly. My tune’s are playing and the house is shining. We can hear songbirds singing and I’m sure I saw Frankie smile. Yep, today’s the day: Aunts and Uncles, cousins and friends. And birthday doings for grand-daughter MJ who just turned 3. Summer gatherings are what summer’s all about! Soak chicken pieces in buttermilk overnight. Don’t keep buttermilk around? Make some, it’s easy! Measure 1 tbsp of vinegar into a 1 cup container and fill the cup with milk. Stir, let stand for 5 min, then pour over chicken pieces. Double if necessary. 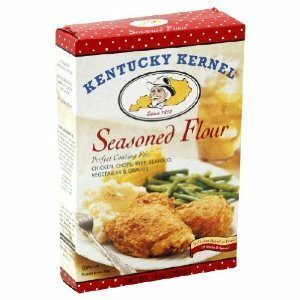 In a separate zip-lock bag or bowl, pour in a generous amount of “Kentucky Kernel Seasoned Flour” and dredge one piece of chicken at a time, coating all sides. Remove and place the pieces on a cookie sheet covered in waxed paper. When all are coated, place chicken pieces one by one into hot oil. (I prefer Canola oil and use a large electric roaster set at 400.). Generally speaking, I use enough oil to cover the bottom of the pan but not enough to drown the chicken. Next, add sliced onions, fresh garlic and seasonings. Cover the pan with the lid, crank up the Bee Gees and return about 30 minutes later to turn the chicken. Once both sides are browned, lower the heat and let the delicious goodness simmer for up to 3 hours. The chicken will be tender, crispy and fall-off-the-bone good. And if that doesn’t make you get up and dance, I don’t know what will! How about you … do you have “fun with it” when you entertain? Looks like beautiful weather for you too…Hope you all have a super fun day! It was a gorgeous day .. the kind of summer day that feels like perfection — a bright, sunshiney day with a mild breeze and very low humidity. You know, the kind that’s a rarity in MI!! And the header is a photo I took in my Dad’s workshop; he saved all those old plates over the years and just added to them as time went on. Always neat to look at, I thought it would make for a cool header. Thanks for your comments, D! Happiest of Birthdays to your wee grandie girl MJ. Sounds like you’ve cooked up a veritable feast! Thank you, Anna. We had a grand day — there were 8 little cousins in all and several great aunties & uncles… 3 generations gathering to be together and also to celebrate her special day. And not much was left over! Maybe amazon.ca? Otherwise … I think it’s flour with lots of pepper 🙂 Rock on to the Bee Gees with me! Sara and I love to entertain, and in the summer we generally do it in our garden. Sara cooks. I decorate. We love parties. Happy birthday to little MJ! Have a beautiful celebration! Ooh sounds wonderful, Kathy. I love to entertain when it’s something I planned and wanted to do – and this was. It was a glorious day, everyone had fun, there was nothing but smiles and giggles all around. Luscious! OLD LICENSE PLATES!!! I love the new photo at the top MJ. Have fun today and take plenty of photos. Thank you, RR, I knew you’d love that. That photo was taken in Dad’s workshop and yes I was able to score 2 of those old plates for my “rumpus room” – one for each boy one day. Dad kept those plates over the years and always displayed them, finding them to be a great conversation starter. See? Still working. Sounds like a fun day brewing at your house! I’ll be hosting our family reunion next Saturday, and I’m going to keep that quote in mind! I hope you have a wonderful reunion this Saturday … remember to rest up and eat something about an hour beforehand .. that always saves me b/c as soon as people arrive I don’t tend to sit still for another few hours. We had a marvelous day … lots of fun and laughs around! Mouth watering good! I love cranking up the music when I cook and clean. Happy Birthday to little MJ!! and it was … there wasn’t many leftovers but that’s OK, I didn’t cook it to keep it. And any chore is always better with tunes :). Miss MJ had a very fun time as did all the other little ones .. and the great Aunts & Uncles did as well. Very nice day. Aw, happy bday to MJ! I love this time of year because of the nonstop cookouts and pool parties. thank you, Darla. I love this time of year for the same reasons … and I get to try out a few new dishes on others that I might not trot out at other times. However, I haven’t exercised in 2 weeks and I can sure feel it .. back at it tomorrow. Love the quote and it sure sound like you are ready to have a wonderful time. Happy birthday to little MJ! I love the header photo, it reminds me of my Dad’s garage. I bet each license plate has a story to tell. Gotta love the Bee Gees! The fried chicken sounds wonderful. Enjoy! Love, love, love the Bee Gees. On a desert Island I’d have to have some BG’s with me 🙂 The chicken was a hit and yes it is gone .. all gone … long gone! Mmmmm… Your fried chicken sounds heavenly. And it doesn’t sound like it’s too difficult to make. I always thought making fried chicken was a huge and messy ordeal. I like your quote! And the chicken sounds yummy! I used to get so stressed when I was cooking for guests. Now I’m much more relaxed and have learned to make easy dishes that are pretty foolproof. Much more fun for me, and I hope for the guests! Thank you, I used to do the same. Now I make easier things and save one thing that I really want to make and concentrate on that … and make as much ahead of time as possible. Enjoy your camping, Sheila!